In the 2.17.5 update, WhatsApp enabled the Status feature, bringing in the same moment the Status and Camera tabs. Do you like the new UI about the new Status and Camera tab? If you choose no, you prefer the Contacts tab (and Favorites for iOS). This poll shows how many WhatsApp users want the Contacts tab back. WhatsApp doesn’t seem to be interested to bring back the Contacts tab, but something will change. WhatsApp is experimenting a new Contact section, on iOS! It will be available under your status updates! 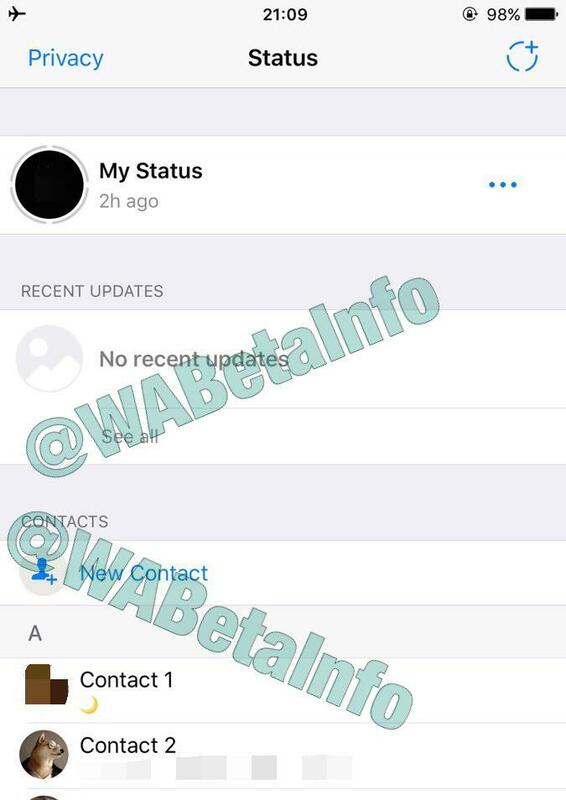 As announced on Twitter, WhatsApp is working on a new Status section in order to add back the Contacts list. 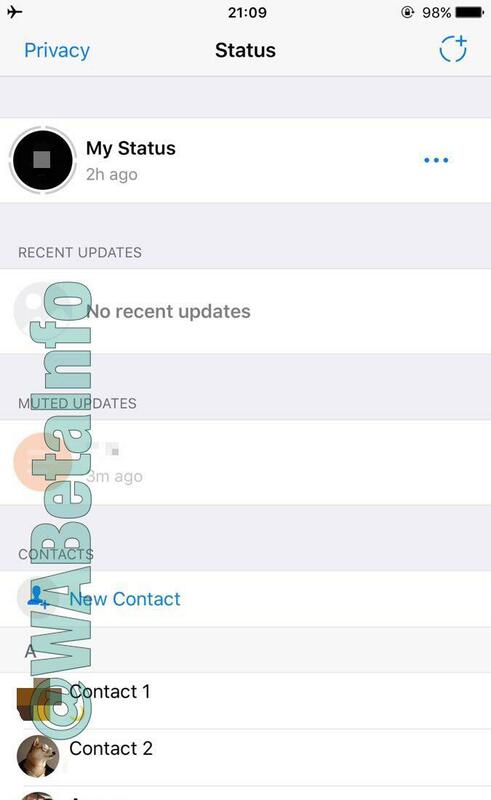 In this new Status section, we can also notice a new icon next to “No recent updates” (that will be shown when there aren’t statuses in last 24 hours), a “New Contact” option, that will allow you to quickly add a new contact in your Address Book and, for each contact, the relative About will be shown. To save space, WhatsApp also thought to add the “See all” button, that will show you all muted statuses. It’s not sure if WhatsApp is going to add back the Contacts list in Android and Windows Phone versions, but we will investigate in next updates if they will do it. This new Status section is hidden and it will be enabled in next WhatsApp updates. Note that this section may get improvements or other changes before the official release. Follow next posts to keep you updated.